Located 1.5 miles from the bridge to Hilton Head Island, Colleton is a place of great natural beauty with towering live oaks, Lowcountry marshes, tidal creeks, lakes and magnificent views of the Colleton and Chechessee Rivers as they flow into Port Royal Sound. Send me more information about Colleton River! The heart and soul of the club are its two championship golf courses, designed by Jack Nicklaus and Pete Dye. Both layouts are ranked in Golf Magazine’s “Top 100 Greatest Courses in the U.S.” In addition, there’s tennis, swimming, hiking, biking, fishing, and boating–it’s all here for the perfect getaway. 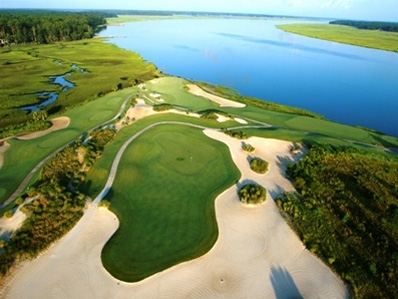 Colleton River’s two golf courses are ‘Top 100’ rated. There’s also fine and casual dining at two clubhouses, a Golf Learning Academy, a member library, art classes, a community dock, even a social community for dogs. Send me more information about Colleton River! Wooded homesites feature beautiful single-family homes with diverse architecture that blends gracefully into the elegance of the surrounding land. For more details and pricing, see the real estate section below. Send me more information about Colleton River! Send me more information about Colleton River! For More Information, or to set up an appointment to see property, call Darle Booher, Carolina Realty Group, at 843-368-5549. Colleton River Plantation is a place of great natural beauty with towering live oaks, Lowcountry marshes, tidal creeks, lakes and magnificent views of the Colleton and Chechessee Rivers as they flow into Port Royal Sound. South Carolina’s Lowcountry is known for its natural beauty, and Colleton River Plantation Club occupies one of the finest pieces of land in the area with 1,500 pristine acres surrounded on three sides by water with over seven miles of scenic shoreline. Members enter the community through a 950-acre nature preserve that buffers Colleton River from the vibrant activities of Hilton Head Island and the town of Bluffton, just moments away. Send me more information about Colleton River! Colleton River Plantation, Bluffton SC invites qualified potential members to try a Member Experience visit. 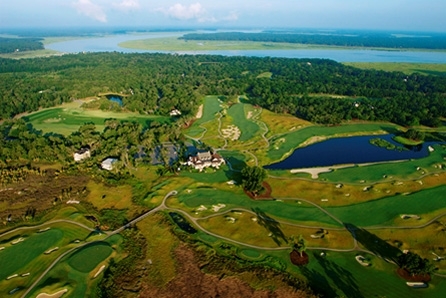 The package includes two nights in a Colleton River Cottage and a round of golf on the Jack Nicklaus Course and the Pete Dye Course. Visitors also receive lunch both days at the Nicklaus Clubhouse, Halfway Café or the Dye Clubhouse and unlimited use of the pool, tennis club, fitness facilities and the Borland Par-3 Course. A club tour and property tour is included in this visit for purchases considering property at Colleton River. Price begins at $499. Send me more information about Colleton River!